We offer this coated 56# face stock with a high grade clear permanent self adhesive and a 56# liner. Print quality is excellent. 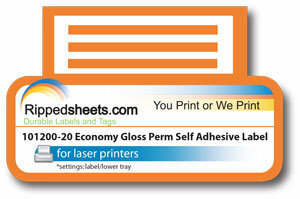 Works well on desktop color laser copiers and printers. (See 101200 for floor model laser printers). Near-Archival safe and acid free. The adhesive on both materials is a clear acrylic adaptable to many surfaces with a minimum application temperature of 50°F and a service range of -65°F to 165°F. This label features a standard pressure sensitive construction including a premium high gloss face stock used in a wide variety of applications, that is cast coated one side and has excellent printability and die-cutting traits. It has an aggressive permanent acrylic adhesive with high initial tack, high shear and ultimate adhesion, and a standard 50# fully bleached kraft liner that offers high internal strength for die-cutting, perforating and refolding. Premium cast coated one side stock with excellent toner receptivity and print characteristics that offers 90% brightness. Fully bleached kraft (lay-flat) liner that has been silicone coated one side to give a controlled release.